Using technology can come at a cost. You don't have to read too many of these Week in Review posts to know that it is not uncommon for individuals to be fired for inappropriate use of email, social media, cell phones, or other means of electronic communication. Past stories have also shown how technology can cost someone their reputation, money, or freedom from incarceration. This week, we add two items to the list of things that technology can put at risk: unemployment benefits, and your health. An employee in Pennsylvania was fired for criticizing his place of employment and coworkers on Twitter. He then applied for and was denied unemployment benefits. The unemployment law judge found that the employee's tweets had violated the employer's code of conduct and that this constituted willful misconduct. The decision was affirmed upon review. 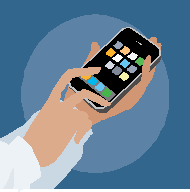 A second article this week showcases the dangers your cell phone may pose to your health. Given the close proximity your phone has to your ears, nose, and mouth, as well as the transfer of germs from your hands, you could be getting sick from the bacteria living on your phone. This problem is compounded by the difficulty of finding effective ways to sanitize the devices without harming them.